The name “Chocolate.com” sounds like the kind of generic aggregator website that your average person might stumble upon when doing a general search. You might think that they sell average chocolate to make a quick buck. This is what I thought when the site first came to my attention. However, I was wrong. Very wrong! 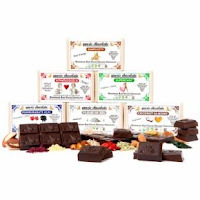 Chocolate.com specializes in handmade, small batch chocolate from small American businesses. Shopping at chocolate.com is like going to an on-line farmers market for chocolate. They only sell high quality chocolate crafted by artisans that truly care about what they are making. As a customer, you can shop by the types of things you would normally expect on a website that caters to gift-giving: shop by: price, boxes or baskets, occasion, type of chocolate, or type of food. You can also shop by ingredients. While their ingredients that you can shop by include things like fruits, pretzels or sugar free, they also have the follow options that appealed to me, and I believe will appeal to our readers: Kosher Chocolate, Organic Chocolate, Gluten Free Chocolate, Vegan Chocolate and Fair Trade Chocolate. These options are what caught my eye when chocolate.com contacted me and said “I would like to offer you the opportunity to review a product from one of our vendors at Chocolate.com…We have plenty of organic and/or fair trade options to choose from.” So yes, I’m doing this review because they offered me free chocolate to check out their site, but when I checked out the site I saw something in which I KNEW our readers would be interested. See our review policy for details on our review philosophy. When I checked out the details, I found that they had 142 options that were completely Fair Trade chocolates. With one click I was able to narrow this to 100 all organic, all Fair Trade choices. Other check boxes toggle on and off whether you want all vegan, all kosher and if there is a particular ingredient such as nuts, soy , sugar, gluten, dairy or eggs that you want in or out of your chocolate. I wish I had know about this when I was off of dairy and soy! The hoops I went through to find good chocolate that was on my restricted diet last year were crazy! I could have just clicked and ordered! I selected Fair Trade, all organic, no dairy, no soy and came out with 32 options! Some of the options are a little pricey, but for quality chocolate and truffles, many of the options are reasonably priced. For those of you that do not live within an easy drive of a great small chocolate shop to support, this is a great way to find quality chocolates that fit with your values and dietary needs, whether that is Fair Trade (which I strongly encourage) or vegan or kosher or any of the other number of things I have mentioned. Now, I would be remiss if I didn’t mention that they sent me some wonderfully interesting and delicious chocolates to try. The Gnosis Chocolates they sent me were so delicious, and their company was so responsive to my questions, and they are so ecologically conscious in everything they do, right down to their packaging and shipping, that I’m going to write a whole separate post about them. Suffice it to say, Gnosis Chocolate from Long Island City, NY is worth checking out for intriguing hand crafted chocolate treats. Wherever you buy your chocolate, look for fair trade and organic. Buying organic limits the pesticides in your food and the pesticides to which the workers are exposed. Fair Trade ensures that the works are treated fairly and paid a living wage. Next Post: Green Your Vacation – Go Camping!